The period in Ireland after 1917 Ireland saw a wave of strikes and a radicalisation of the working class on a scale never before witnessed on the island. A key event in this period was the Limerick Soviet that saw the working class of the city take control of the city for a period of two weeks. Aislinn O’Keefe writes about this defining event in the history of the workers’ movement in Ireland. While Sinn Féin’s program of a capitalist independent Ireland meant the supplanting of one ruling class in favour of another, the Limerick Soviet, for a brief period, signaled the potential for a complete break from the system of capitalism to be replaced by workers power and socialism. There was a rich stew of events and factors locally, nationally, and internationally that influenced the episode that unfolded in Limerick at the instigation of local workers in April of 1919. 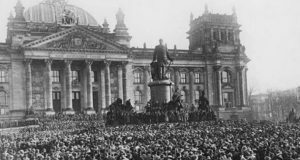 The barbarity of World War I was just had just ended in 1918 as a result of the German revolution. Tens of thousands of Irish people were killed or injured in the war, while in Ireland the effects of war meant a sharp increase in inflation and a dive in living standards. It was these harsh economic conditions that saw a huge rise in trade union membership across the country before the war ended. The threat of military conscription in the Spring of 1918 had resulted in the first general strike in Ireland, resulting in the defeat of this proposal. But it was an event that occurred over 3,500 km away in Russia that proved to be the greatest of inspirations. That event was the Bolshevik Revolution of 1917. The revolution had such an impact on the psyche of Limerick workers that during the first May Day demonstration in Limerick in 1918, where 15,000 workers marched through the city, a resolution supporting and congratulating Russian comrades was read out to the demonstrators to great applause. It was against this backdrop that events escalated in Limerick in April 1919. After the shooting dead of prominent trade unionist and IRA member Robert Byrne, British authorities took fright when thousands attended his funeral in a show of defiance. They subsequently imposed martial law on the city. This meant that, among other restrictions, workers in the city and the outskirts were required to present work permits at military checkpoints on their way to and from work. This proved to be the final straw for workers who were already dissatisfied with reduced wages and conditions and they refused this imposition on their freedom of movement. A general strike was called by the Limerick Trades Council across the city. The predominantly female workforce of Cleeve’s factory was the first to strike, with not a single employee reportedly turning up for duty. A strike committee was formed leading to the setting up of a soviet inspired by the Bolshevik example. The soviet was a democratic body of workers that set about the task of running the city. Subcommittees were set up to ensure the supply of food and the printing of workers’ newspapers. Utilities such as electricity, gas and water also came under the control of the workers committee. The streets of Limerick were abuzz as citizens congregated with excitement, and a spirit of solidarity ensured no plundering or looting took place. 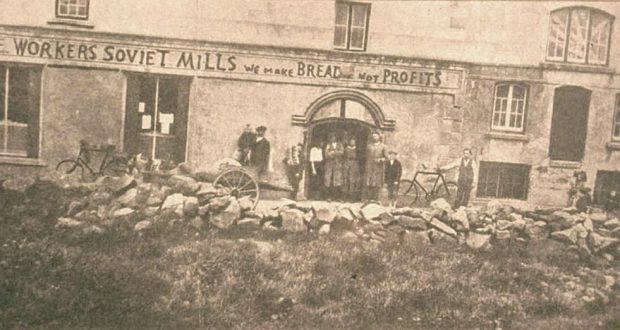 While scaremongering by the British establishment suggested that necessary supplies could not be guaranteed, the reality was that the working classes of Limerick received more food than they had received since before the war with no small thanks to the bakers of Limerick who ensured a daily supply. When workers inevitably ran out of money (workers were not being paid) the soviet, unfazed, responded by printing their own currency which was accepted by many businesses in town. Outside Limerick, there was huge support for the workers with news of the Limerick Soviet reaching many parts of the globe. In Ireland, important sections of the labour movement favoured a nationwide general strike to escalate the workers’ struggle. This, unfortunately was not favoured by the trade union leadership who took their cue from Sinn Féin, which opposed the self-organisation of working-class people. A replication of the Russian revolution was precisely not what the leadership wanted for Ireland and efforts were made to thwart a general strike. Instead, the solution proffered by the union leadership was that the entire working population of Limerick leave the city to be housed by trade unionists around the country in order to avoid the dreaded permits which had sparked the strike. This ridiculous scheme had the desired effect, and the Limerick workers were demoralised by this lack of support. A split arose between the working class and the middle classes in the city. The soviet came to an end. Despite its ultimate failure, the Limerick Soviet stands as an inspirational example of workers solidarity and organisation in action. It also provides many lessons that can be learnt today, including the outcomes that might have been had there been a revolutionary socialist party organised and poised to challenge the conservative trade union leadership that could have escalated the strike nationally. The example from this small city on the edge of Europe proves what is possible when workers unite. As 1919 dawned Belfast was the scene for a bitter strike by engineering workers demanding a reduction in the working week. The strike saw the workers of Belfast effectively running the city with 60,000 workers engaged in a month’s long struggle. This was to show the potential to unite the working class across sectarian lines in a struggle for socialist change. Only weeks later the workers of Limerick established the Limerick Soviet in defiance of the decision by the British military authorities to impose martial law. The failure to act by the national leadership was to become a constant refrain during the revolutionary period in Ireland. As the year progressed the ITGWU was to engage in widespread strike action throughout the country. The rising class struggle impacted on other trade unions. The membership of the ITGWU grew from 5,000 in 1916 to 120,000 by 1920 with the membership of the Trade Union Congress rising to over 250,000. For working class people an end to the status quo meant more than legislative independence. It meant both national and social liberation something capitalism in Ireland was incapable for providing. When 1920 dawned the Irish working class posed a direct challenge to the nationalist leadership in Sinn Fein for control over the revolutionary process. Land seizures were widespread, particularly in the west of Ireland. Workplace soviets sprang up around the country as workers occupied their workplaces to force concessions from employers. This threw the Sinn Fein leadership into a panic as they struggled to prevent the national movement being torn apart by the class struggle. 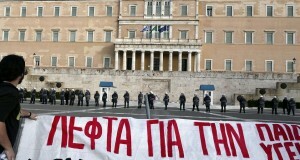 This was demonstrated during the general strike demanding the release of prisoners in April 1920. This has always been presented as a strike for the release of republican prisoners, but over half the prisoners were trade unionists and many of those on hunger strike were trade union activists and socialists. 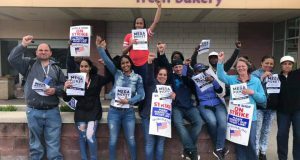 The general strike once again demonstrated the power of the working class. In towns and cities all over the country ‘Red Guards’ patrolled the streets and marshalled huge demonstrations. Workers committees were established to control food distribution and transport. Many roads were blockaded with barbed wire or fallen trees. The success of the strike forced to British government to release all the prisoners in detention. Once again the labour movement had an opportunity to become the dominant revolutionary force in Ireland and once again the trade union leadership balked at the prospect. Despite this land seizures, workplace soviets and strikes continued. The post-war economic depression hit hard in 1921. The bosses began demanding job cuts and wage cuts. Following the truce between the IRA and the British in June 1921 a major strike wave broke out around the country. Once again, the nationalist leadership were faced with Sinn Fein being torn asunder under the pressure of class struggle. Michael Collins issued an order that any IRA member engaging in strike action was to be court-martialled. By May 1922 up to 150 workplaces were under workers occupation in what became known as the Munster Soviets. In many areas ‘Red Guards’ were patrolling the strikes. Thousands of farm labourers were on strike, faced with repression from both pro-Treaty and anti-Treaty forces as well as ‘White Guards’ organised by the Farmers Association. On a number of occasions the ‘Red Guards’ were forced to engage in gun-battles with both wings of the IRA to defend workers on strike. The strike-wave and the workplace soviets were ultimately suppressed as the Free State forces implemented widespread repression around the country. As quasi-fascist Special Infantry Corps were established in the police with the specific mandate of suppressing strike action by farm labourers. 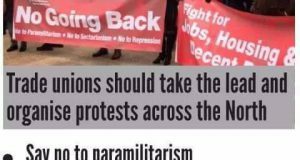 The armed ‘Specials’ brutally suppressed strikes in Waterford and Kildare, burning homes, beating up picketing workers and randomly arresting and torturing people they saw as supporting the strikes. While workers struggled valiantly to defend their jobs and conditions through all of these events, the leadership of the Trade Union Congress and the ITGWU stood idly by abandoning the workers they were supposed to represent. ITGWU leader, William O’Brien, stopped the strike pay for striking farm labourers and removed them as union members. The workers went down to a massive defeat and the trade union movement suffered near collapse. The ITGWU membership dropped from 120,000 to 11,000 as the new Free State government implemented what James Connolly had earlier called a ‘carnival of reaction’ with widespread repressive legislation and censorship in the years after independence. None of this was inevitable. The leaders of the labour movement had within their capacity to unite the working class, North and South, Protestant and Catholic in a struggle to overthrow capitalism and imperialism on this island. In doing so, they could have laid the foundation stone for a socialist society free from sectarianism, oppression and exploitation.